For more than 15 years, Pascale Lévesque was led to photograph your favourite artists across Quebec, as worldwide. 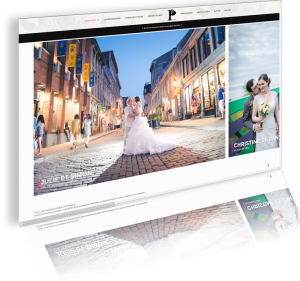 Specialized in events, portraits of artists and entertainment, Pascale Lévesque is now moving towards weddings, destination weddings, maternity and your family. She had to have an online portfolio worthy of the greatest photographers. Following the design of her new logo, Pascale and myself attacked the modernization of her website. Its former site was designed in Flash, thus was not visible on mobile media such as tablets and smart phones. For Pascale, it was critical that the new site could be displayed on these media.